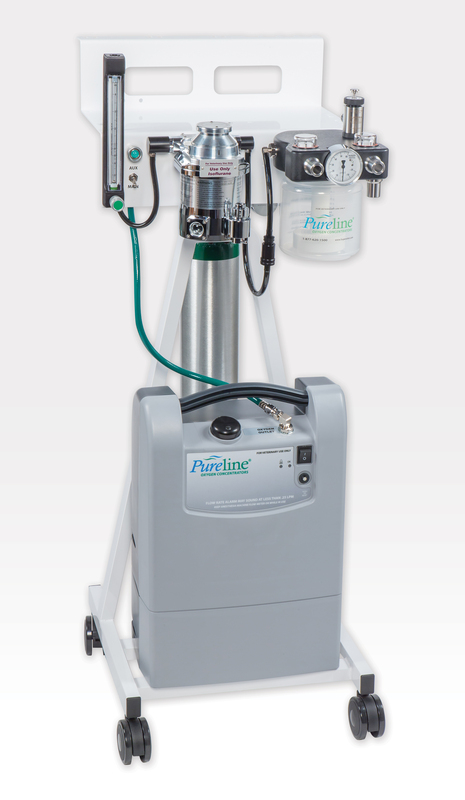 The Pureline® M6000 extracts medical-grade oxygen from the air and delivers it on demand. 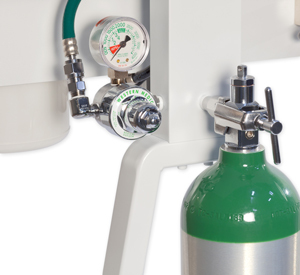 With the savings in oxygen tank refills or tank management, the M6000 pays for itself in as little as one year. 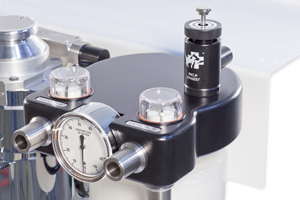 No larger than standard anesthesia equipment, it comes complete and ready to operate. The M6000 is quiet, elegantly simple to operate, and requires almost no maintenance. Supera has perfected the technology, added important safety features, and is making this money-saving equipment available to you. Can I use it with my existing anesthesia equipment? Yes. 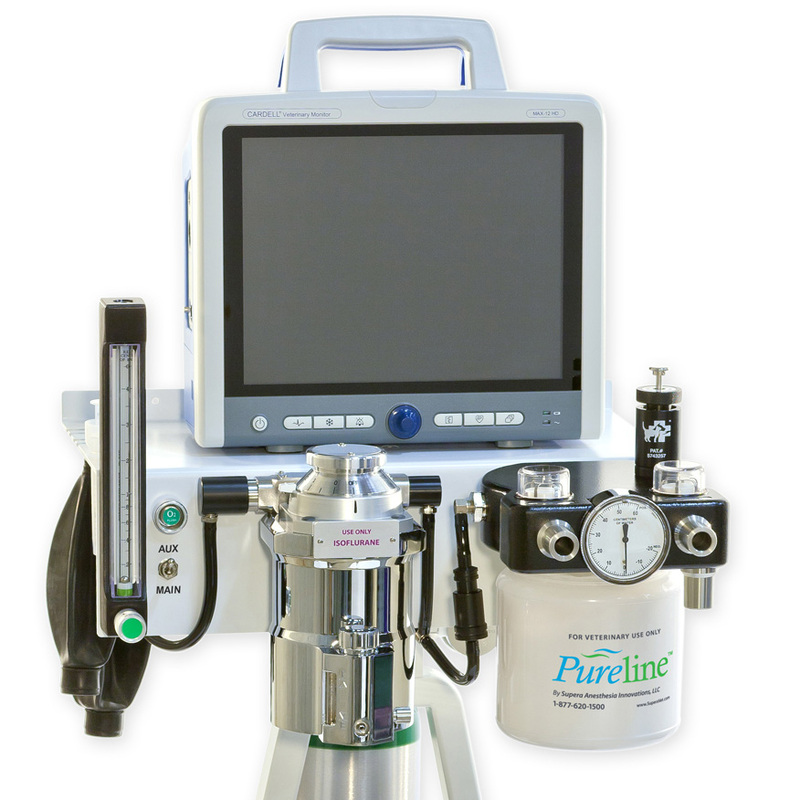 The Pureline M6000 works with all types of vaporizers and anesthesia machines. There is some "Misinformation" out there! False! – The maximum pressure a vaporizer can have is 2 psi. psi has very little to do with flow rate. Truth – 1 psi is equal to 70.3 cmH20 – when was the last time you operated an anesthesia machine above that? Our concentrators have seven times the pressure needed to operate the anesthesia machine. Truth – 50 psi is the industry standard for human hospital medical gas oxygen systems. Truth – Ventilators require 40-50 psi of air pressure to operate. We offer our VT3100 drive gas pump for this purpose. Why would you use expensive oxygen to drive your ventilator? The drive gas never mixes with the oxygen being supplied to the patient. How does Pureline’s oxygen concentrator work? The Pureline M6000 draws in room air through a filter. A compressor sends the filtered air to a solenoid valve, which moves it into one cylinder of Pureline’s two-cylinder design. This two-cylinder design ensures a constant supply of USP 93% oxygen; while one side is being used, the other side is being replenished. Under pressure inside the cylinder, the molecular sieve material attracts and holds the nitrogen from the room air (21% O2). The enriched oxygen is directed to the pressure regulator, a final filter, and finally out to the anesthesia machine. Remember, while one cylinder is in use, the other is refilling with enriched oxygen ensuring you a constant, reliable supply of oxygen. If this is so good why haven’t we had it already? Veterinary anesthesia machines with oxygen concentrators have been in use in Europe for years, but have not been used in the United States due to the prohibitive cost of the concentrator. Recent developments have brought down the cost of oxygen concentrators and made them extremely cost effective. In addition to the lower cost, Supera Anesthesia Innovations has added safety features that European models don’t have, perfected the design for use with anesthesia machines, making it easier to use and utterly reliable..
What safety features does Pureline® have? Pureline is FDA approved and UL tested. It is made of the highest-quality materials and is built in the USA to the highest ISO quality standards and certified by TÜV SÜD America. TÜV SÜD America is a globally recognized testing, inspection and certification organization. The Pureline machine itself features both audible and illuminated safety alerts and has an emergency backup oxygen supply (standard E tank). With the Pureline M6000, you get your medical-grade oxygen for free (electricity cost is abount $0.50 per 6 hours), on demand. By eliminating tank rental, refills, and tank management, Pureline enables you to save thousands per machine, per year. In fact, it could pay for itself in as little as one year. Where is it made? Why should I care? The Pureline M6000 and all Supera products are Made In The USA in our Oregon manufacturing facility. Our plant and products are fully certified for quality and safety. Supera product design begins with ergonomic and ease-of-use considerations. Our products are simple, technologically advanced, and require very little maintenance. You can count on Supera’s simplicity to make your job easier and our made-in-the-USA quality to give you many years of reliable service. All Supera anesthesia machines are backed by our 10-Year Warranty. All Pureline concentrators have a 3-year warranty. Should you ever need service or technical advice, Supera technicians are easily accessible and ready to help. •	The coarse cabinet filter should be cleaned as needed in your environment. Order P/N OC4000-1. Call 1-877-620-1500 for replacement filters. •	Change fine intake filters during yearly anesthesia service call or every 2 years. Order P/N OC4000-2. Call 1-877-620-1500 for replacement filters.